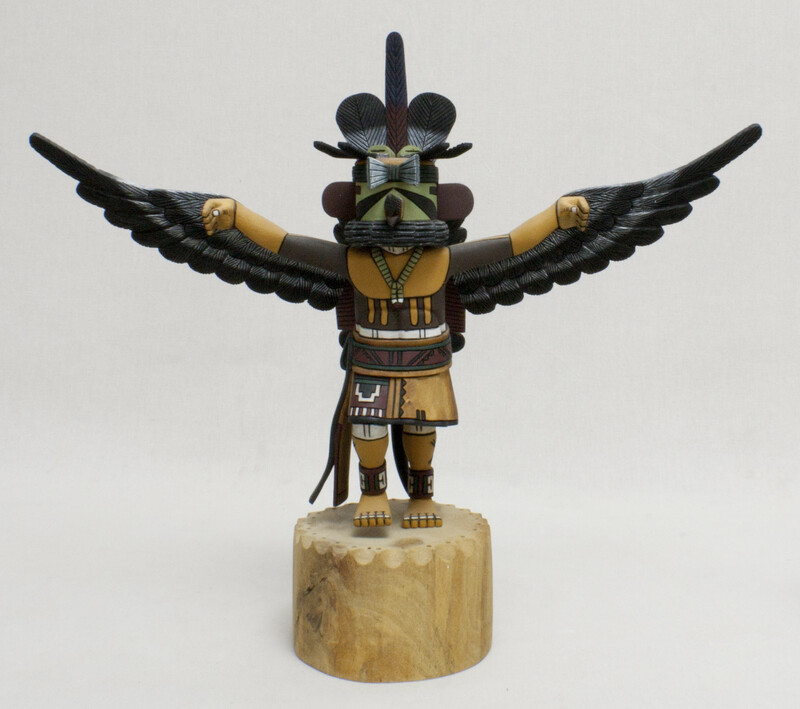 This post is the second segment of our two-part spotlight on the Kachina dolls that came into our studio. This part will focus on the treatment of the Cumulus Cloud Maiden that was mentioned in our earlier post. Before treatment photo showing a view of the front. The Cloud Maiden came into our shop in several pieces. Kachinas are prone to breaking because the cottonwood they are made from is very soft and fragile. In this case, the figure had broken off from the base, and some of the feathers on the tunic and headdress had become detached. The owner had saved several of the pieces but others were missing. After taking an inventory of what could be reattached and what had to be recreated, we set to work. Before treatment photo showing a view of the back. Before the breaks could be addressed, residual adhesive from a previous repair had to be removed. The adhesive was first softened with water and then removed mechanically. 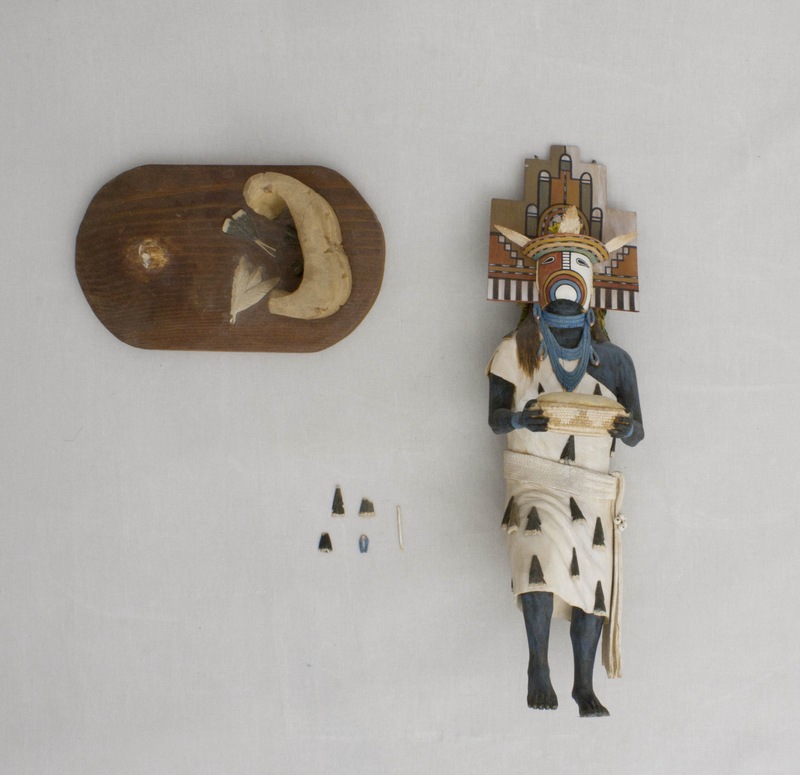 After the adhesive was reduced, the broken pieces were reattached to the Kachina. In order to stabilize and strengthen the joins, small pins were inserted. Carbon fiber rods were used to make the pins for the broken feathers. 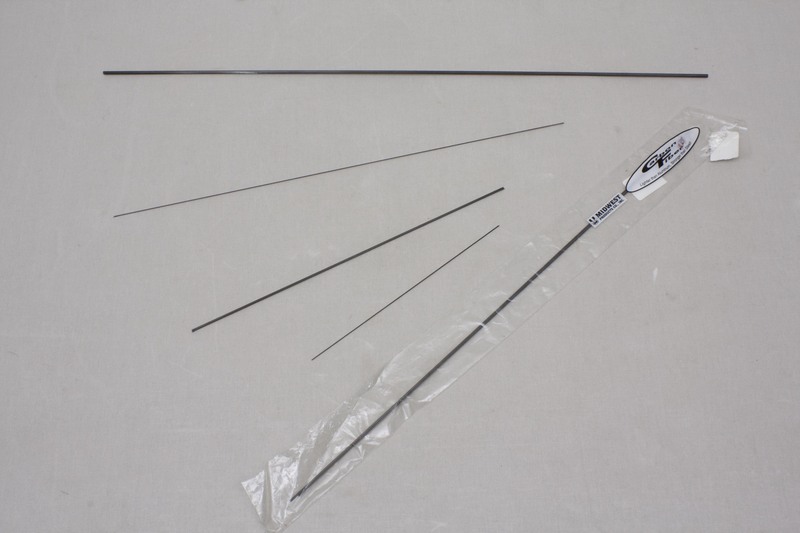 For small or lightweight broken elements, carbon fiber rods (made of epoxy reinforced with carbon fiber, see http://www.conservation-wiki.com/wiki/Carbon_Fiber) are ideal because they have high tensile strength, so a thin (1.2 mm diameter) pin can provide plenty of support. Examples of carbon fiber rods. By contrast, to reattach the Cloud Maiden to its base a bamboo pin was used to join the two sections together. Wood was considered the preferred material to support this larger surface area break because it is not as hard as the carbon fiber. A larger carbon fiber pin would be much stronger than the original material and could potentially damage the cottonwood if an impact occurred. After treatment photo showing the front. Once the broken pieces were adhered, our expert technician Katy took to recreating the lost feathers. To do this she used two different techniques. For the feathers that were entirely missing she carved new ones out of balsa wood. Although balsa is not the type of wood originally used by the artist, it has similar properties, is lightweight and easy to manipulate. Once the she got the shape right, she set about toning the replacements using gouache. The new feathers were then attached using carbon fiber pins and bulked fish glue. The fish glue was bulked with cellulose powder to act as a gap filler where material had been crushed or lost at the break. After treatment photo showing the back. For feathers that had lost only their tips, Katy also used tiny carbon fiber pins, this time as posts onto which she could build up the feather shape. To recreate the tips she used Modostuc and then inpainted the feathers with gouache. The treatment was successful and the Cloud Maiden left looking fabulous. A round of applause to Katy for her excellent work. Hi All! Sorry for the long absence but things have been very busy this year! We have had our hands full with so many interesting projects, but in this post we’d like to feature a particularly colorful group of objects we’ve been working on since fall. 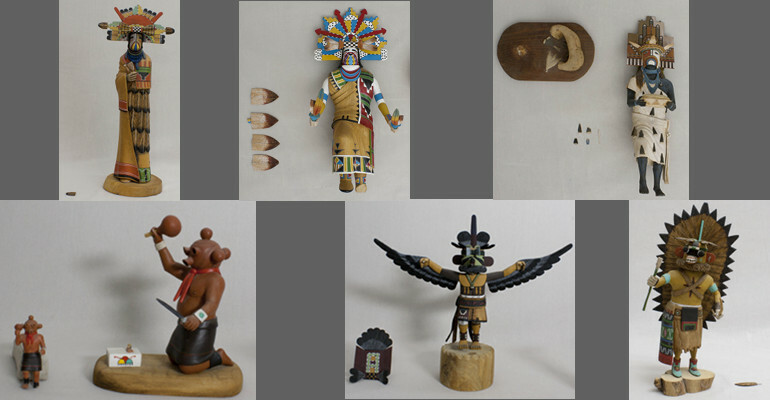 So begins our two-part spotlight on the six Kachina dolls that came into our studio looking for help. This post will detail the cultural context of the pieces, and the next part will describe some aspects of the dolls’ treatment. Kachinas are iconic objects of Southwestern Native American Art. These Kachinas come from the Hopi Tribe. 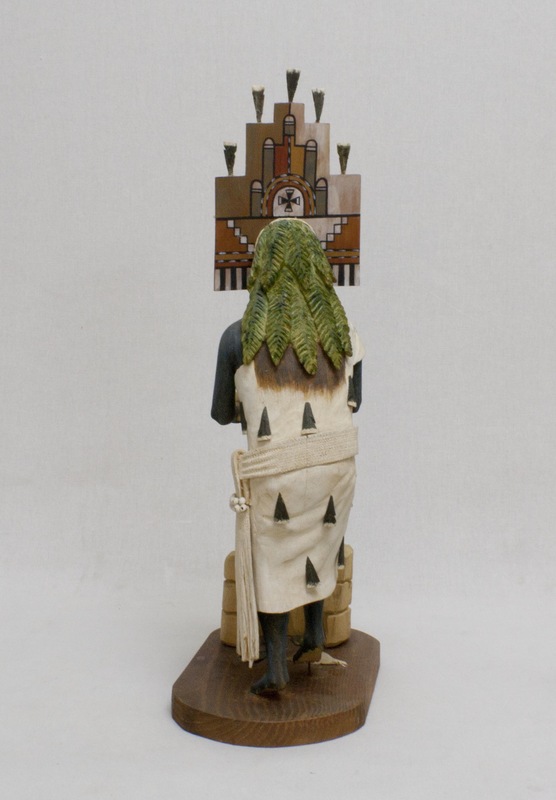 They are not objects of worship but rather depict the many different types of Kachina spirits. 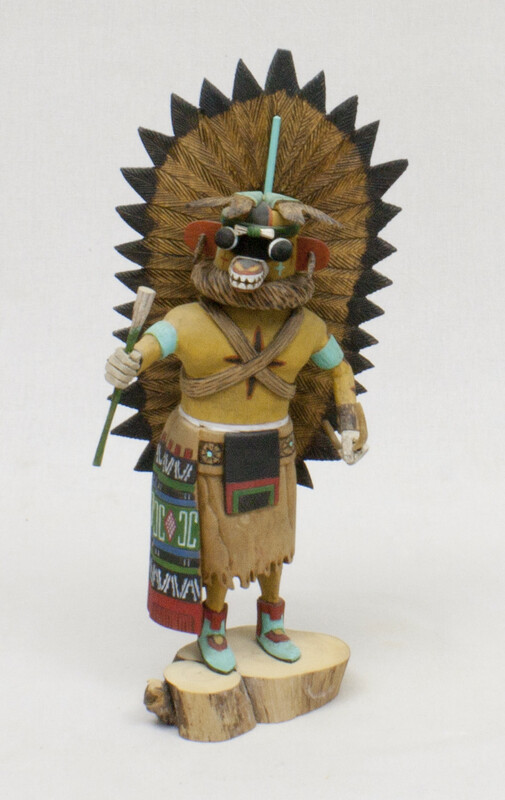 A Kachina doll, also known as a tihü, is traditionally given to a Hopi Girl at a ceremonial dance. 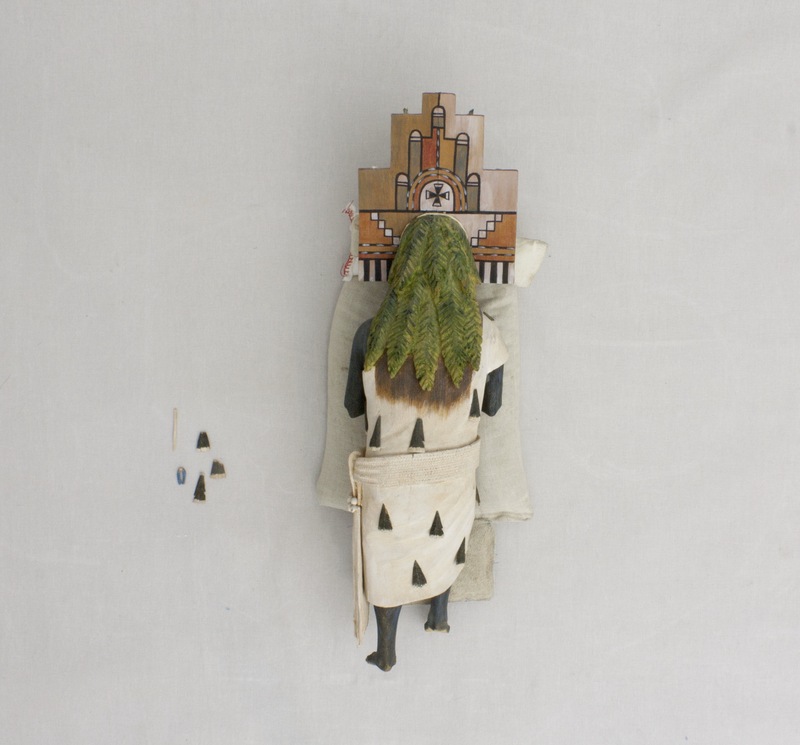 They function as decorative objects, toys and didactic objects that tell the stories of the Kachina spirits. 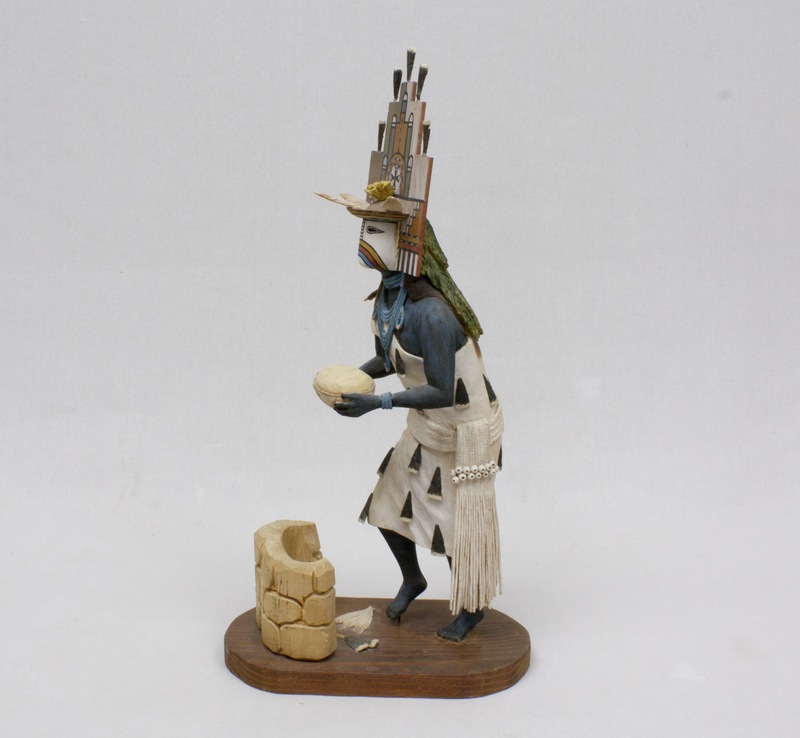 In more recent years, native artists have manufactured Kachinas for export. Kachinas are carved out of the roots of the cottonwood tree. The wood is very soft and easy to carve. Traditionally, Kachines were carved using knives and other customary tools but today native artists use modern tools such as chisels, Dremel tools, hand and power saws, pocket knives, X-acto blades and wood burning irons. Kachinas are highly decorated and brightly painted. Historically feathers, fur, leather, yarn and seashells were used to decorate the dolls. Our dolls do not have any additions other than carved wooden elements and paint. In the past, pigments made from natural ochers and minerals would be used. In more recent years Kachinas, like the ones in our studio, have been painted using acrylics. Color is a symbolic feature of the Kachina mask. 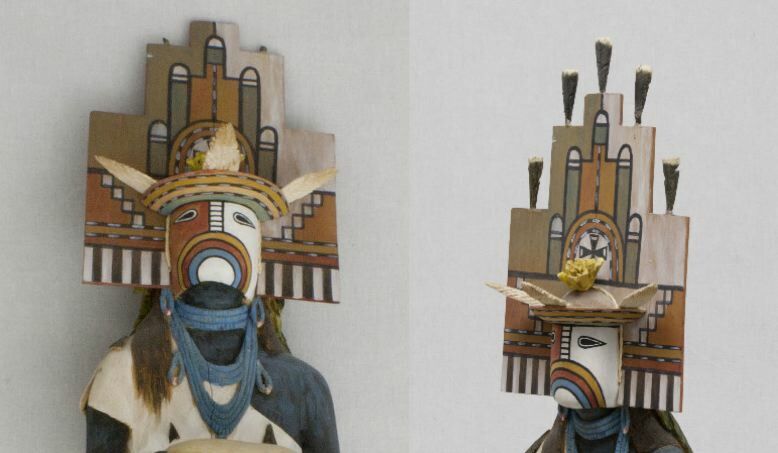 Six colors and color combinations indicate the direction from which a Kachina originally came to the Hopi village: yellow-north, blue-green- west, red- south, white- east, grey or a combination of the above colors- up and black- down. The different iconographies of the Kachinas identify them as specific spirits. 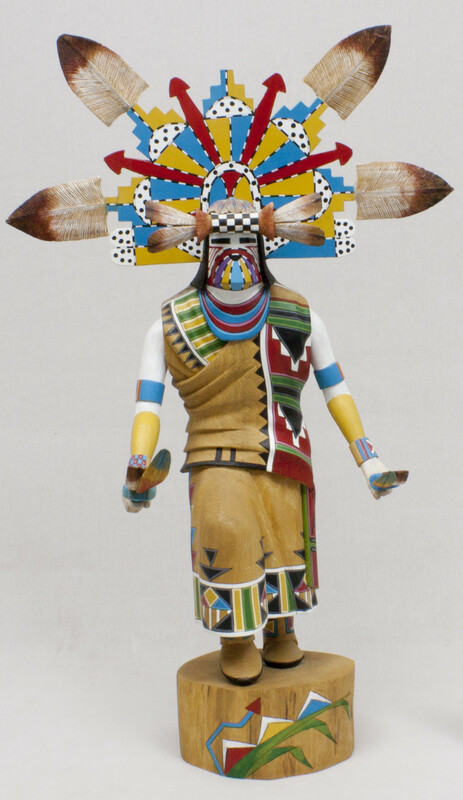 An example is the Kachina shown below, which depicts a blue spirit standing on one foot as if mid-dance. The figure is draped in a white robe with small blue feathers attached to it. The spirit holds a tray of cornmeal. The half of the face mask is painted brown and the other half is painted white. A rainbow symbol splits the two colors. The tablet above the face depicts cloud and rain symbols. The color of the form, the tray of cornmeal, the style of the mask and the cloud symbols on the tablet identify this figure as the Tukwünag Kachin-mana or Cumulus Cloud Maiden. The Cumulus Cloud Maiden appears in Hopi Shalako ceremonies. To read more about the history of Kachina dolls, the stories behind the different spirits or the Shalako ceremonies please check out the books and article listed below. Bassman, Theda. Treasures of the Hopi. Northland Publishing Company Flagstaff, AZ. 1997. Colton, Harold S. Hopi Kachina Dolls: With a Key to Their Identification. University of New Mexico Press. Albuquerque, NM. 1987.